ALBANY, NY (WSKG) – With less than a week to go to the budget deadline, Gov. Andrew Cuomo said talks are proceeding in “good faith” with the legislature, but he said many differences still remain. And he indicated that lingering resentments over the failed Amazon deal might be coloring the discussions. Cuomo, giving a budget update to reporters Friday, said the legislature wants to spend too much without providing enough revenues, which he calls “mathematically impossible.” And he said he still wants a permanent property tax cap, an end to cash bail and other criminal justice reforms, and a ban on plastic bags in the budget. The governor continued to blame Senate Democrats, though for Amazon’s February 14 decision to pull out of a major project in Queens. The Senate nominated an Amazon opponent to a key oversight board, known as the Public Authorities Control Board, or PACB. 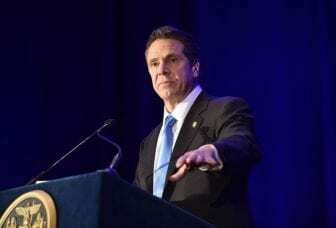 Cuomo later walked back those comments, saying the law was not violated and corruption did not occur because the appointment of the opponent, Deputy Senate Leader Mike Gianaris, was never finalized.